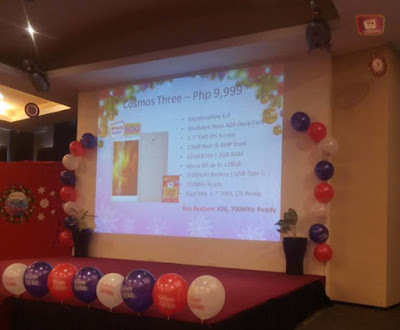 The Cherry Mobile "Desire" event is happening tomorrow, and it seems that more devices are going to be unveiled aside from the Flare Premium series as the local mobile brand showcase several models at their dealers provincial road show, one of which is the Cherry Mobile Cosmos Three. The Cherry Mobile Cosmos Three packs a 5.7-inch Full HD display powered by MediaTek Helio X20 10-core processor coupled with 3GB of RAM and 32GB of on board storage. If the leaked image above is true, it will be the second handset from them next to Cherry Mobile M1, to boast the Helio X20 chipset. The other specs revealed during the road show are 13MP main shooter, 8MP secondary snapper, 3,500mAh battery, USB Type-C port, Android Marshmallow and 4G/LTE connectivity, including the 700MHz band. In terms of pricing, it has an asking price of Php9,999, which means it is a top-of-the-line offering from CM. There are several specs missing, but once known, we will update this post or create a new one.